Behind the Hedgerow: Eileen Slocum and the Meaning of Newport Society takes viewers inside the private world of aristocratic Newport, Rhode Island – a world of privilege that began with the Gilded Age, when Vanderbilts and Astors reigned. WSBE Rhode Island PBS is proud to present the television premiere of the critically-acclaimed film on Wednesday, April 6 at 8 p.m., with re-broadcast as part of the ongoing WSBE series, Rhode Island Stories on Saturday, April 9 at 7 p.m., and Sunday, April 10 at 11 p.m. The story's central character is Eileen Gillespie Slocum, descendant of the Nicholas Browns and friend to all of the 20th century Newport (and New York and Philadelphia) elite. When Slocum died on July 27, 2008, at the age of 92, a storied period of American history ended. Slocum was the last of the Newport grand dames – one of the last grand dames anywhere. America had changed, and so had the world; a new moneyed class now ruled, although descendants of the Gilded Age elite continue to live on and near one of America's most exclusive addresses, Bellevue Avenue, Newport. Slocum's family granted filmmakers G. Wayne Miller and David Bettencourt exclusive access to her archives and private Bellevue Avenue estate, where much of the film was shot. The story is brought to the screen through the use of rare footage and still photographs, through filming of key Newport Society events during the summer of 2009, and through on-camera interviews of people in Eileen Slocum’s set and Slocum’s family. The filmmakers use Slocum’s extensive personal archive of photographs, books, belongings and papers – most notably, the diaries she began keeping at the age of nine as she was growing up in an eight-story mansion at the corner of New York’s 89th Street and Fifth Avenue. She continued to write these diaries into the 1990s. They are an intimate and never-before-seen account of life behind the hedgerow. While Eileen Slocum is the protagonist of the story, Behind the Hedgerow has an intriguing supporting cast, including such prominent Newporters as Hugh D. Auchincloss III, known as Yusha, and Betty "Boop" Blake, a noted art collector who winters in Texas. Both Yusha and Boop were lifelong friends of Eileen. Both appear for the first time ever in a film. The narrator of the film is Eileen Slocum herself. Through a newspaper series he wrote about Newport society, G. Wayne Miller, a longtime staff writer at The Providence Journal, became a confidante of Slocum's. During their long relationship, he spent hours recording Slocum as she discussed her life, her world, and her beliefs. 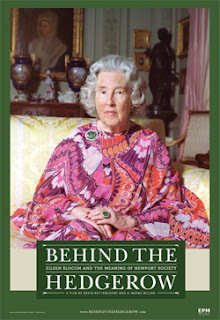 Because of Eileen Slocum’s stature, her relationships with virtually everyone in the world of old money, her long life, and her intelligence and candor, Behind the Hedgerow is uniquely entertaining, informative and, in certain passages, amusing. Visit the film Web site for more information about Eileen Slocum and Behind the Hedgerow.